If you are the type of shooter who believes that all worthwhile advancement in firearms technology ceased at the turn of the century, and I mean circa 1900, then you will be pleased with the products of the Marble Arms Company. Although Marble Arms uses state-of-the-art CNC equipment, the products are made with the quality of old world craftsmanship, by folks in Gladstone, Michigan. Recently I received one of their peep tang-mounted sights, and that is the subject of this article. 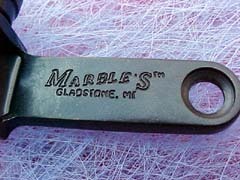 This is not a new product, or the latest variation of the hottest thing on the market for shooters, but rather a product that has been made by the Marble people for over 100 years. This sight contains no carbon-fiber, plastic, aluminum, or the latest titanium alloy......it is made of real, honest-to-goodness blued steel. The first impression upon opening the box was one of quality. It is sad that today we have come to expect something less than first quality from many products. We expect to find a flaw somewhere, or a piece of plastic that is made to look like steel. I stuck a magnet to every component visible on the Marble sight, and it stuck with a gratifying, solid feel. 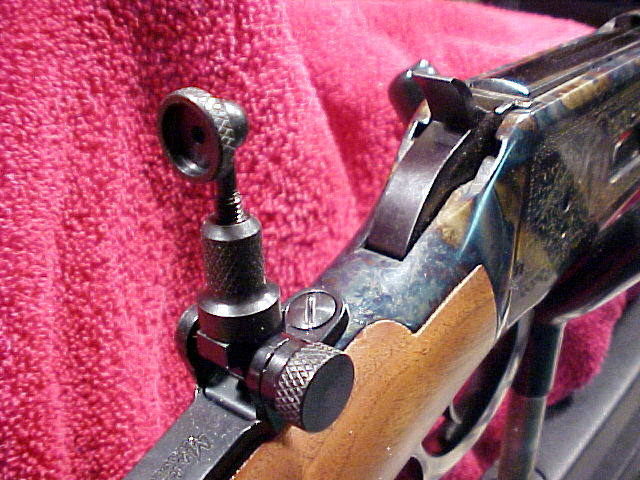 The sight sent to me was made to fit the Winchester model 1894 action. I decided to mount it upon my .38-55 Marlin-Ballard chambered Chief Crazy Horse rifle. This rifle was made in limited quantities to celebrate the great Indian warrior. 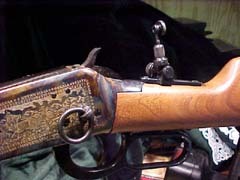 The Marble's sight seemed to be a product that would enhance the shooting qualities of this fine rifle, without degrading the aesthetics as would a scope sight. 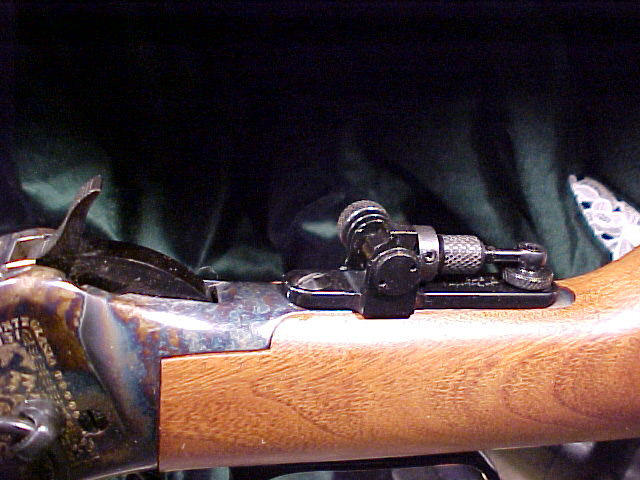 The Chief Crazy Horse was found to shoot a bit high with the factory iron sights, so I installed a Marble's taller front sight along with the tang peep sight. 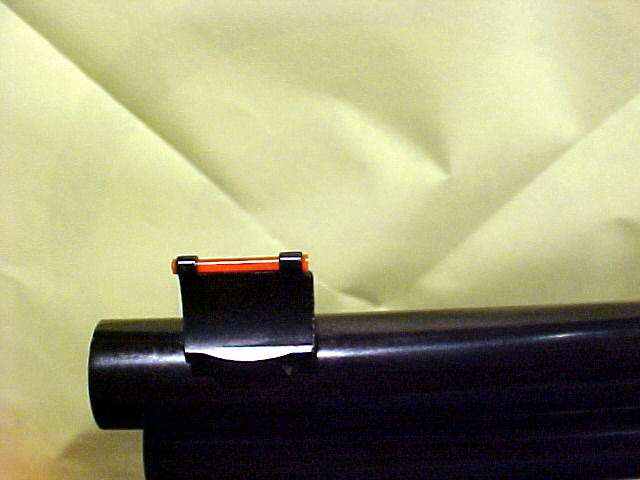 The red bead of the Marble's front sight is much more visible in low light than the original. 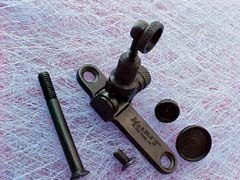 The installation of the tang sight requires the drilling and tapping of one hole into the tang of the rifle for the forward sight screw, which is provided along with a new rear screw to complete the mounting of the sight. 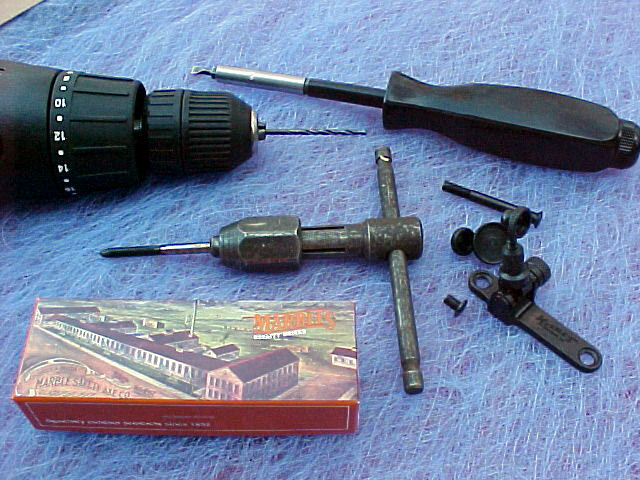 The process is not difficult, but requires the proper drill and tap, along with a screwdriver. I completed the process in about 20 minutes, and any good gunsmith could do the chore for a nominal fee. My local smith charges five bucks per hole to drill and tap. Whether you choose to do it yourself, or have it done, it is a very useful addition to a lever-action rifle. It is much easier to shoot with precision with this type of sight. Besides providing a longer sight radius, the act of precisely aligning the front and rear sights is greatly eased with the aperture of the rear sight. Marble's supplies the sight with three different interchangeable aperture disks to suit any shooting situation. The sight enabled me to effective improve my shooting ability with the gun. 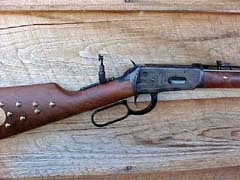 I believe that the Marble's peep tang sight would be ideal for the sport of Cowboy Action Shooting in the long-range rifle matches. The sight is both well made and authentic. 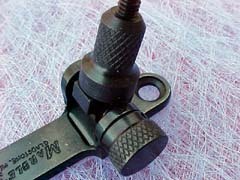 It is easily adjustable for windage and elevation, with each click adjustment moving the point of impact about two fifths of an inch at 100 yards. The Marble's sight retails for $125 directly from Marble Arms. For the quality, durability, and shooting enhancement, it is money well-spent. 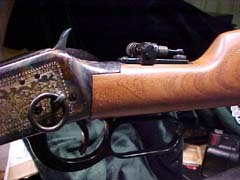 The sight provides the lever-action shooter a useful and beautiful piece of historically correct craftsmanship, that will improve his ability to accurately place his shots. All content © 2001 GunBlast.com. All rights reserved. Click the pictures to see a larger version. 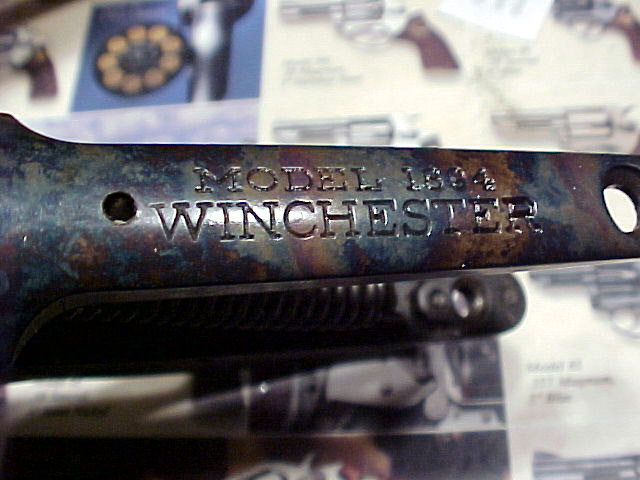 Author's newly-acquired Winchester Model 1894 Chief Crazy Horse commemorative rifle in .38-55 with Marble's tang sight installed. 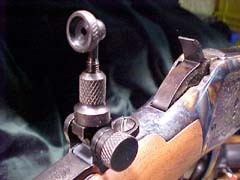 Marble Arms Company's tang sight for the Winchester Model 1894, shown with screws and extra apertures. Marble's tang sight adds a great deal to the practical accuracy of the Model 94 Chief Crazy Horse commemorative without detracting from the classic lines of the gun. Adjustment knobs for windage and elevation are easy to use, positive and aesthetically pleasing. 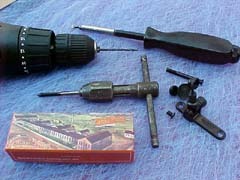 Tools required to install Marble's tang sight: drill, properly sized screwdriver and tap. 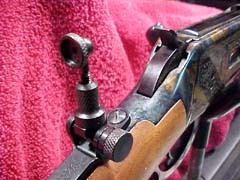 Mounting the sight is an easy job, and can be inexpensively done by a gunsmith if you don't feel up to drilling & tapping a hole in your rifle. 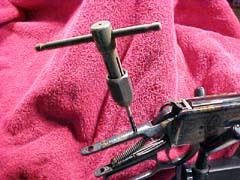 The additional hole required for the sight has been drilled. Tapping the additional hole required for the sight. Author installed Marble's taller front sight with fiber optic insert to aid shooting in low light conditions. 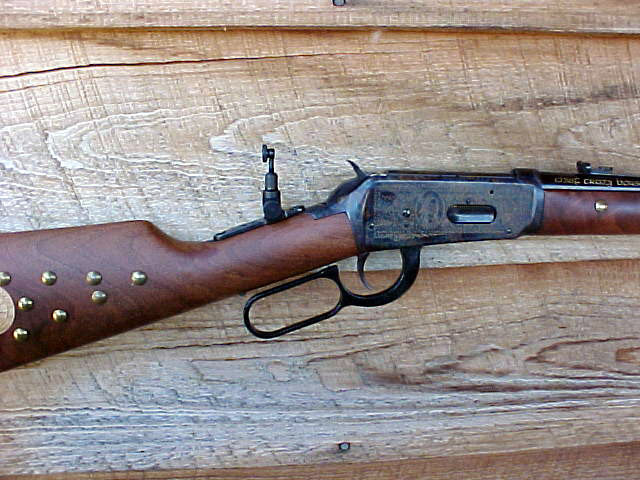 Author believes Marble's tang sights to be a practical way to enhance the shooting qualities of a lever gun without detracting from the beauty of the rifle. Marble's sights should be ideal for the Cowboy Action Shooter looking to enhance practical accuracy for long-range matches.